Neko Harbour is a smaller side bay on the northern coast of Andvord Bay, which cuts into the west coast of the Antarctic Peninsula at 64°50’S. As anywhere in the area, the coast consists mainly of calving glacier fronts, occasionally steep rock cliffs, so stepping on the coast of the actual continent is possible only at a few places. Neko Harbour is one of these. Solid crust of granitic composition situated on the coastline of the continent itself, that is good enough to convince both geologists and tourists. The scenery is stunning. A huge glacier has its calving front just a few hundred meters from the stony landing site. The bay is accordingly often filled with brash ice. 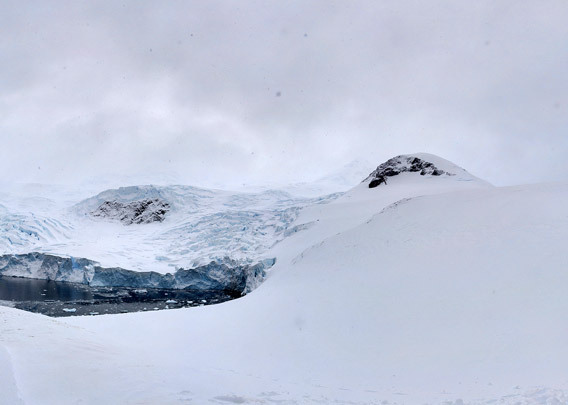 If this is blocking the shore, then the result is bad luck indeed … and awareness is needed if you move around near the shore in the vicinity of the glacier. Should it calve, then you have to move up and away from the coast quickly (or towards deeper waters if you are in a boat), otherwise you will be in deep trouble soon due to the wave that follows every major calving. Neko Harbour was discovered in early 1898 by Adrien de Gerlache from Belgium and named after a Norwegian whaling ship that operated in the area from 1911 to 1924. 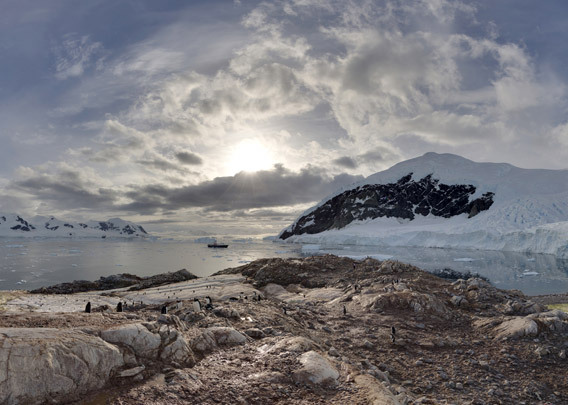 A nice day in Neko Harbour is truly a taste of Antarctic paradise. 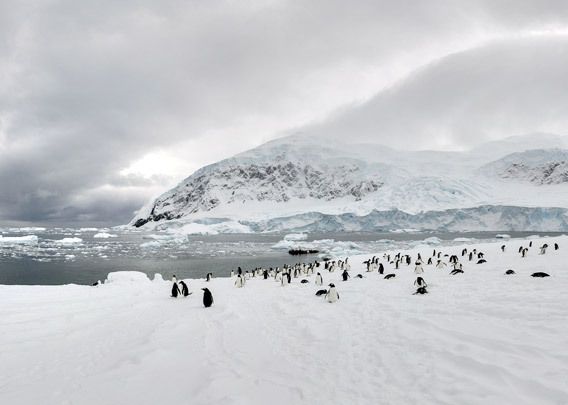 Several hundred Gentoo penguins breed there, and often Leopard seals are lurking in the water, waiting for the careless penguin. Minke whales are quite frequently seen. You will have a great view over Neko Harbour and Andvord Bay from the hill above the colony. Some remains of an emergency shelter destroyed during a storm some years ago give testimony to the amazing forces of nature that can rage in Antarctica. 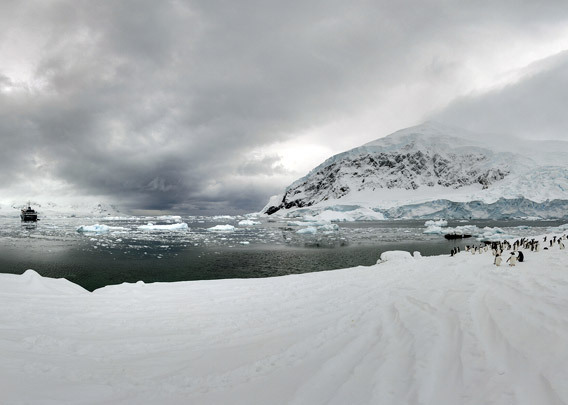 The weather was a bit grey when I took these panoramas in mid November 2013. There was still a lot of snow on the ground. It was an unforgettable morning for all involved, and it even cleared up to clear sunshine in the afternoon.